A bleak, desperate, brilliant finale. 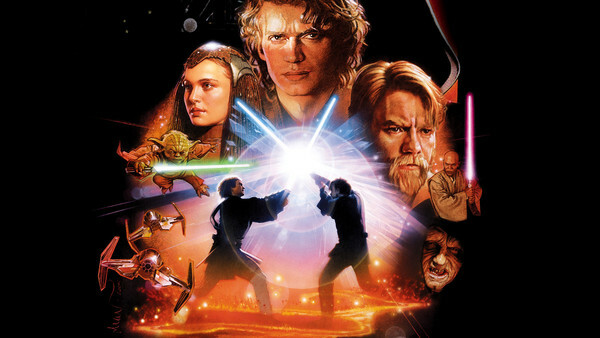 Generally considered to be the strongest of George Lucas' Star Wars prequels, The Revenge of the Sith (a great parallel title to Return of the Jedi) was heralded on release, even making its way onto a few year-end Best-Of lists for those critics who could truly see what the film was trying to achieve. Since then it seems to have gone pretty much the same way as the films that preceded it, with early anticipation and acclaim dwindling to the point where Revenge now gets labelled as the best of a bad bunch, or some other reductive derivative. But, as I've tried to explain with The Phantom Menace (for the most part) and Attack of the Clones (overwhelmingly), that's simply not fair. If we set aside the prequels' chief flaws, the ones that most use as arguments against the new trilogy - so general poor acting, questionable and overused CGI, unintentionally hilarious dialogue, unintentionally not-hilarious comedy set-pieces - and consider the brilliance of the their epic narrative and emotional sweep, then we get a completely different trilogy. One which swats its flaws aside like droids to become something grander, something closer to the originals than most would ever let you believe. What's more, the prequels convey at times beautiful and meticulous tableaux, and their ability to mirror the original saga - sometimes shot-for-shot in a way that brings to the franchise a totality - creates an ambitious vision of a galaxy far, far away that comes full circle by the time the credits roll here. And Revenge of the Sith is perhaps the strongest example of this notion, this idea of a film steeped in franchise mythology. Strong in its allusions to the history of the series, and strong as a stand-alone film, Revenge is easily the bleakest movie in the franchise, one which delivered in its promise to show Anakin become Vader and doused it in emotional heft. By the end, it is a dark, brooding mood-piece which wouldn't be suitable for kids were it not a Star Wars film. The dénouement of the film is just one part of its magnificent whole, however, so here's seven more (six really, with one slight grievance) examples of how spectacular it is en route.